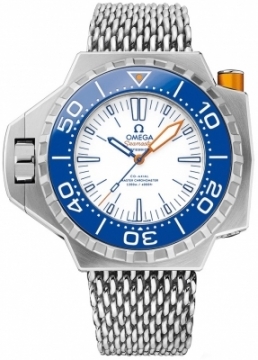 Buy this new Omega Seamaster PloProf 1200m 227.90.55.21.04.001 mens watch for the discount price of £7,560.00. UK Retailer. Applied blue polished rimmed hour markers with luminous fill. Fine blue printed minute track. Blued steel hour hand with luminous fill. Blued steel seconds hand with orange tip & small rectangle luminous filled segment. Brushed & polished titanium bezel with electric blue polished ceramic fill. Provided with an additional electric blue rubber strap.